At around the same time as December’s Paris climate summit, Australia unveiled a National Energy Productivity Plan. RMIT senior industry fellow Alan Pears explains what this is, and how Australia can achieve it. In December last year, all climate and energy policy eyes were on the successful Paris climate summit. So you might have missed a new part of Australia’s energy policy, the National Energy Productivity Plan released by the Council of Australian Governments’ Energy Council (chaired by federal energy minister Josh Frydenberg). The plan aims to improve energy productivity by 40 per cent between 2015 and 2030. According to Frydenberg, the plan will improve Australia’s competitiveness, help households reduce energy bills, and reduce carbon emissions. The Department of Environment has indicated that the plan will play a large part in meeting Australia’s 2030 climate target. That sounds great – but what exactly is energy productivity, and how can we achieve it? Energy productivity is the new buzz-phrase in energy policy. Basically, it means delivering more economic activity from each unit of energy consumed. More broadly, it can be framed as getting more value from each dollar spent on energy. US President Barack Obama has set a target of doubling US energy productivity by 2030 from a base year of 2010. Studies by ClimateWorks and the Australian Alliance for Saving Energy have shown how Australia could achieve a similar outcome. Australia’s notional target is a 40 per cent improvement between 2015 and 2030. Relative to a 2010 base year, this is an 80 per cent improvement. The plan notes that over half of this would be achieved under business as usual, without further government action. Improved energy productivity can be achieved in a number of ways, most obviously by more efficient energy use. But other measures such as driving innovation, shifting our economy’s structure towards low energy intensity activity such as high value services and manufacturing, and improving performance of energy markets are also important paths. Basically any action that increases GDP while using less energy than expected counts as an improvement in energy productivity. So the plan fits nicely into our government’s new focus on business innovation and restructuring after the collapse of the mining boom. It provides a focus for response to scathing criticisms of electricity and gas markets by the Productivity Commission in 2013, a Senate Inquiry in 2012 and concerns about high gas prices driven by the explosion of Queensland LNG exports. It also provides a range of ways to meet our 2030 climate abatement target. A separate work program documents the measures in detail. Many of the measures are very worthwhile. They build on our experience to date, as well as addressing limitations of and problems created by past policy. This is the big challenge! Australia has a sorry track record in promoting energy efficiency, policy capture of energy market policy by powerful incumbents, and lack of energy innovation in industry. 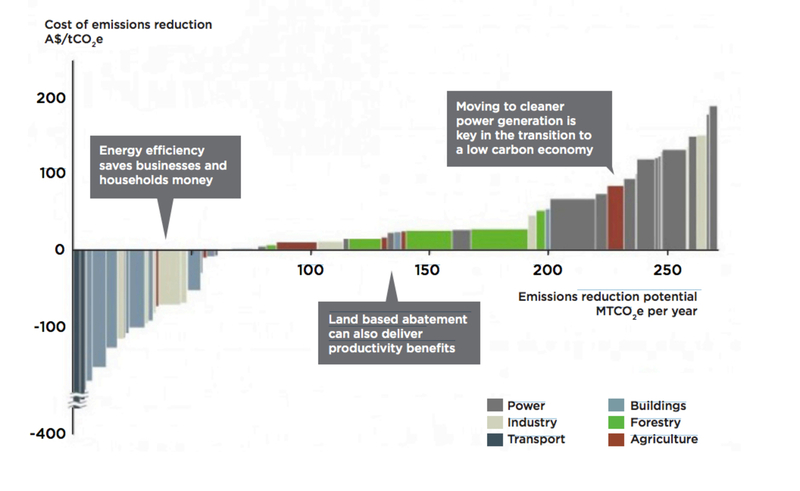 While groups like the International Energy Agency see energy efficiency improvement as delivering half of reductions in energy-related carbon emissions up to 2040, it is rarely mentioned in Australian energy or climate policy debate. For example, the headline of Labor and Greens energy policy is growing renewable energy, and energy efficiency improvement barely rates a mention. Yet everyone recognises that energy efficiency improvement is the most cost-effective option. The reality is that the barriers to effective action on energy productivity improvement are very challenging. Powerful groups across the economy, such as some building industry organisations, big industry groups and the energy sector have been reluctant to support strong policy. While they mouth support, their actions undermine progress. Building energy policy has stalled. The internationally highly regarded Energy Efficiency Opportunities industry program was strongly opposed by key industry groups, and was shut down by the Abbott government. The energy productivity plan provides little reassurance that this will change. The COAG Energy Council, whose track record in this area has been woeful, will still be in charge, and proposes a review “before 2020”. 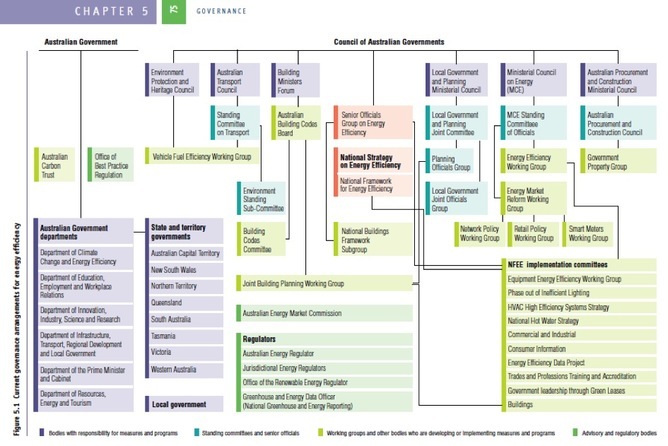 The 2010 Energy Efficiency Task Force published a map of the governance structure of energy efficiency in Australia (see below). Its complexity and lack of strong, focused leadership guarantees failure. Indeed, the very useful work done by this task force has never received a formal response from government. Funding is another concern. No additional funds have been allocated. It is assumed that productivity measures can be accommodated within existing funding arrangements. In reality, a lot of work is needed, research must be carried out, and implementation will require funds for incentives and transition assistance. We need a powerful, well resourced lead agency with strong ministerial (and indeed, prime ministerial) leadership to implement the energy productivity plan. Maybe this is an opportunity for new energy minister Josh Frydenberg to demonstrate his capabilities. Environment minister Greg Hunt could begin to rebuild his credibility on climate action. And Prime Minister Malcolm Turnbull could prove he is serious about his innovation agenda. After almost 40 years working in this space, I am not optimistic. The forces undermining energy productivity improvement in Australia are deep-seated, pervasive and powerful. On the other hand, the need for change is great, the benefits of effective action are enormous, and the credibility of some opponents is in decline. Alan Pears is senior industry fellow, RMIT University. This article was originally published on The Conversation.